Here are the slides for the talk I gave last Friday on Protein-Ligand Docking at the EBI Small-Molecule Bioactivites course. For three or so slides I drew heavily from Leach and Gillet's "Introduction to Cheminformatics", which I recommended to the course participants. To follow the slides, I prepared a self-guided tutorial that used the GOLD docking software to dock ligands taken from Kinase SARfari to a kinase crystal structure taken from the PDB. If this is of interest, let me know. I'm just back from an EBI workshop on Small Molecule Bioactivities where I was invited to talk on protein-ligand docking. The workshop was mainly focused on introducing the participants to the databases being maintained and developed by the ChEMBL team at the EBI. This team is lead by John Overington who blogs over at the ChEMBL-og. The ChEMBL databases (ChEMBLdb and Kinase SARfari) are well worth checking out, and they have a very active team working on additional databases right now including one on SAR data for GPCRs, and another with information on clinical candidates. Apparently, the databases are designed to be easy to integrate with existing in-house proprietary data and this has already been done at the Institute for Cancer Research. At some point, they will be releasing a public interface to some of this data called CanSAR. One interesting feature of this meeting was the number of systems biology people present, rather than hard-core cheminformaticians. These were PhD students and postdocs trying to integrate information from many different sources including small-molecule information. I thought it was a great meeting, and I will be keeping an eye out for similar workshops in future. Word on the street is that Rajarshi will be over in mid-May to present a workshop on Cheminformatics in R so I might be back here again soon. That will cover RCDK and RPubChem among other topics (see links in an earlier blog post). I'll add a link here when registration opens. If you are interested in a PhD developing open source tools for cheminformatics, I would be interested to hear from you. The Irish Research Council has just opened this year's call for PhD applications for PhDs starting next September. This competitive funding is open to EU students only and is offered on the basis of the student's merit. The student will be based in the School of Pharmacy, University College Cork. The exact project will depend on the background and interest of the student but will involve the development of software or algorithms in the area of cheminformatics. 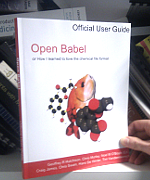 I have a track record of involvement in international collaborations on open source software such as OpenBabel, as well as developing novel algorithms in cheminformatics, and scoring functions for protein-ligand docking. If interested, please send your CV along with a cover letter addressed to Dr. Noel O'Boyle at baoilleach@gmail.com. The cover letter should briefly describe why you are interested in applying for a PhD with me. Note that the IRCSET deadline is 10th February so applicants should get in touch as soon as possible. University College Cork: University College Cork, founded in 1845, is one of Ireland's oldest institutions of higher education. Its first professor of mathematics was George Boole who developed the logic that underlies modern computing. The university has 18,860 full-time students: almost 12,000 undergraduate students and some 3,200 students at postgraduate level. Cork: Cork is situated in the south-west of Ireland, and is the second city of the Republic of Ireland. It was recently named by Lonely Planet as one of the top ten cities to visit in 2010. It is situated in County Cork, an area of outstanding natural beauty.